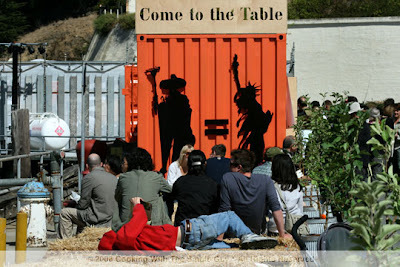 Today I'm wrapping up the second part of my report on Slow Food Nation's Taste Pavilion at Fort Mason in San Francisco's Marina district. I spent most of the day Saturday exploring the different pavilions, trying to use up my $20 "slow dough" voucher. If you didn't read part 1 of my report, be sure to check it out here. 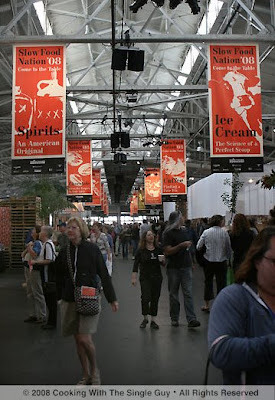 The various food pavilions at Slow Food Nation took up the entire Festival Pavilion building at Fort Mason. But it also poured outside to the front area, with a pavilion for Indian food, Native American food, baked goods, bread and beer. But the most popular pavilion was probably the pizza pavilion. The wait in line was more than 30 minutes. 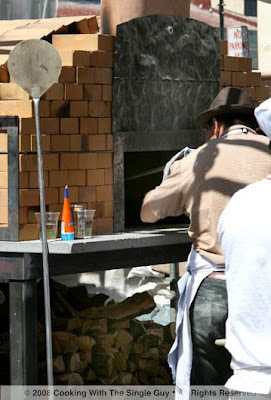 Above, a worker tends to the brick, wood-fire oven set up just for the event. They had a whole assembly line creating thin-crust pizzas. 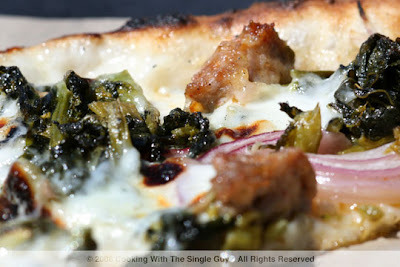 There were two options: a traditional margaretta and a rapini and sausage pizza. It wasn't all eating at the Taste Pavilion. 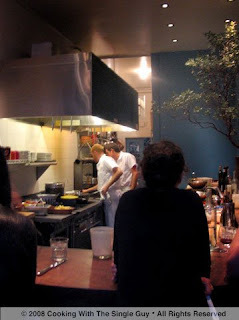 At the Green Kitchen, there were demonstrations going on all day. I didn't stay for all because, well, I rather do the tastings. 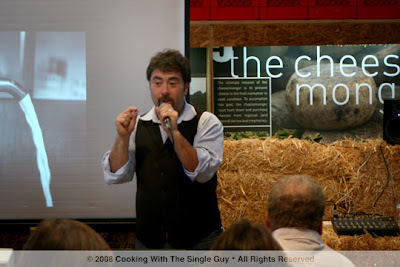 But I had to check out two of the major chef celebrities that showed up on Saturday. 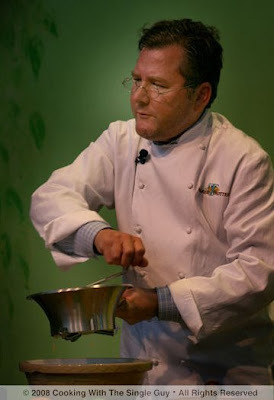 The first was Charlie Trotter, the legendary Chicago chef. A little trivia, in the opening scene of "My Best Friend's Wedding," Julia Roberts plays a food critic and the restaurant she's at was supposedly a fictional one run by Trotter. 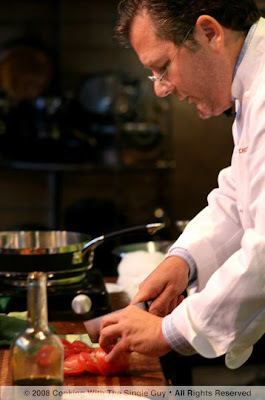 Chef Trotter demonstrated recipes using seasonal ingredients so that meant heirloom tomatoes. Here he's making a cold tomato soup using yellow tomatoes that he's squeezing through that hand crank. It looks fancy but I can tell you it looks like your arm will fall off after using it. The Green Kitchen set up wasn't ideal for a food demo. The burners weren't that hot and they didn't have an overhead mirror so you couldn't see the food from above. So that meant I couldn't really take a picture of Trotter's tomato soup. He passed it around but it was too dark to photograph. It did look beautiful after he added cucumber and olive oil and seasoned with citrus. 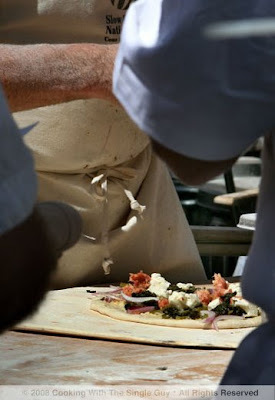 He sold it to an audience member (along with dinner for two at his Chicago restaurant) for $250 to benefit the Edible Schoolyard Program (which is Alice Waters' youth gardening program). He's such a good guy. 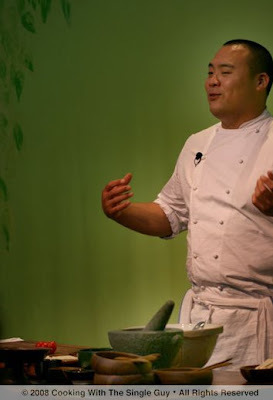 The other chef who could tear me away from all the tastings was Chef David Chang, the toast of the town in New York City. Chang is the owner of Momofuku Noodle and Ssam Bars and his new Momofuku Ko, a 12-seat intimate restaurant. He's garnered a lot of praise for his inventive Korean-style dishes. I was surprised how young Chef Chang looks, and he seemed a bit nervous speaking in front of everyone because I could see his hand shaking as he worked his food. He was also cooking with tomatoes. 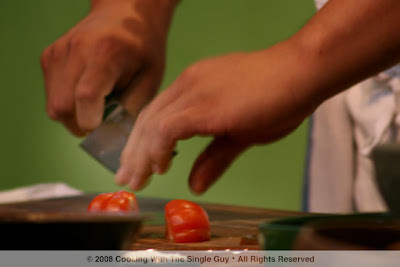 Here he's cutting some cherry tomatoes. He's going to make a tomato tofu dish with very minimal cooking, using mostly the tomato juice and a marinade of soy sauce, sesame oil and a whole bunch of other spices that he didn't explain but just pinched and dashed into a bowl. I guess he wants to keep his recipes secret. 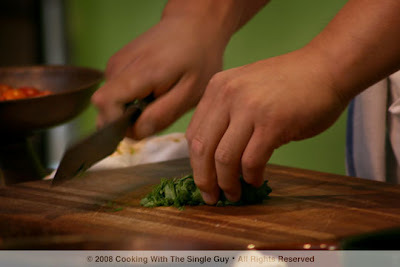 One of his secret ingredient is shiso leaves, which is a Japanese herb similar to mint but very distinctive. He chiffonade the leaves and tossed it with the tomatoes. Back to the tastings. I went over to the wine pavilion, which was huge in the back of everything. 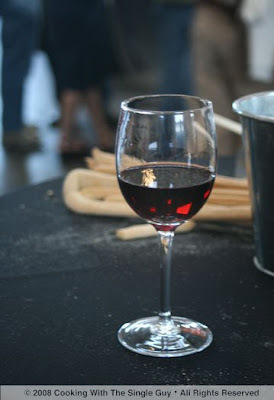 All the wines were from wineries that are sustainable and uses organic ingredients. There were individual glasses for tastings around the back and tables for flights. 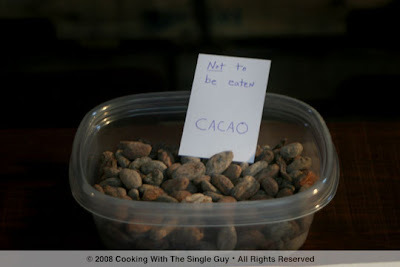 It was a bit overwhelming, and this will be my only negative note about the Taste Pavilions. Many of the food stations were manned by volunteers who didn't necessarily work at the farms or producers. So that meant they couldn't really answer questions about how things were made, etc. 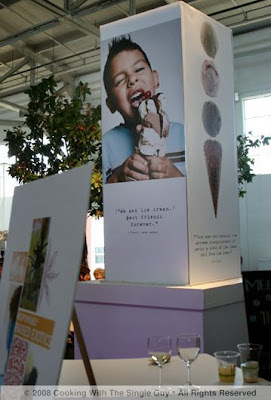 I felt they missed out on the educational component of the Taste Pavilions. Sometimes you lucked out and actually got the farmer or owner behind the counter, but most times not. Here's a glass of a 2006 Pinot Noir I tried from Bouchaine Vineyards in Napa. It was young with a bit of tannins, but had a lot of legs (which means it was quite alcoholic). It tasted much better after I let it breathed for awhile. After wine, I visited the tea pavilion. 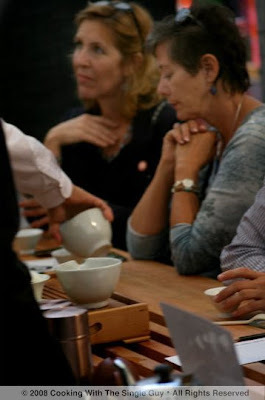 It was funny how tea is supposed to make you relax, but I was stressing because the line to get to the tastings was long and I was pushed up against the start time to see David Chang at the Green Kitchen. Slow Food was especially slow at this very moment. When I finally got a seat, I was at the oolong table. 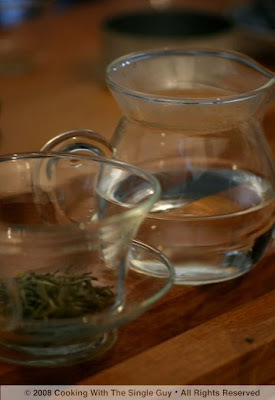 I love oolong but turns out the person giving the tasting was from Teance, which I've visited before. I love Teance, but I was hoping to learn something new. Oh well, it was a very nice cup of pheonix honey oolong from China. 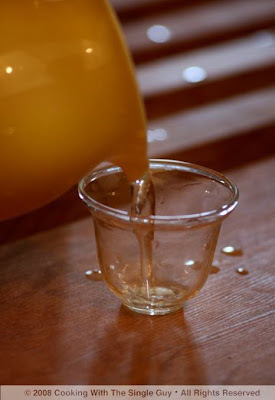 I kind of like how they served the tea in these little glass cups. So cool. But don't let your kids play with them. 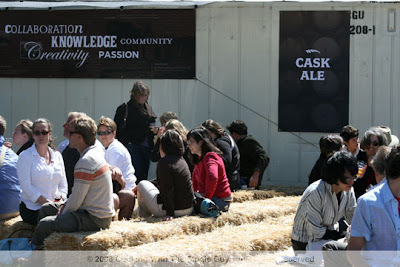 Here are people relaxing and enjoying themselves outside the beer pavilion in a haystack area set up by the Slow Food people. Slow Food Nation's Taste Pavilion turned out to be a really fun event and not necessarily as chaotic as I thought it might be. Everyone was in a good mood and I loved meeting people and chatting with them about what they tried and what they liked. I wished I could have visited all of the pavilions (I missed the pickled pavilion which got a lot of rave reviews), and I only used up $10 of my $20 voucher, mostly because you lose time waiting in lines. Still, I think I tried enough things to feel like I got a lot out of the experience and reminded me again of why I love living in the Bay Area. 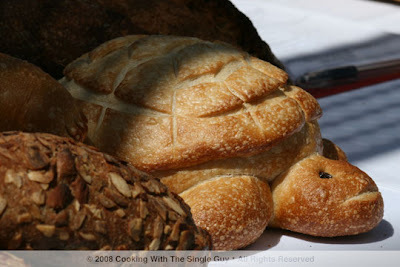 Slow food rocks! 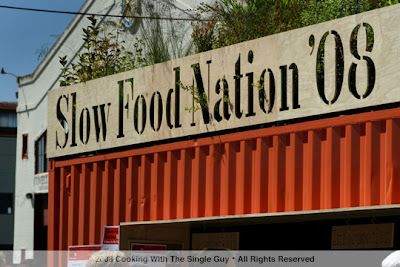 Slow Food Nation is the anti-fast food event, a celebration of local, sustainable food nurtured by farmers and cooked with natural ingredients for tasty meals. 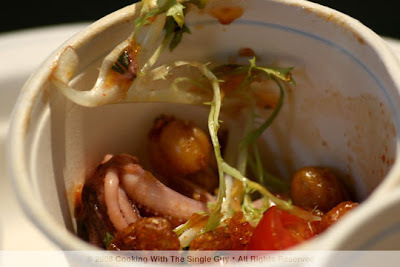 Several events are occurring around the city (primarily at Fort Mason in the Marina and the Civic Center), but the one that's drawing the crowds is the Taste Pavilion at Fort Mason's festival pavilion. 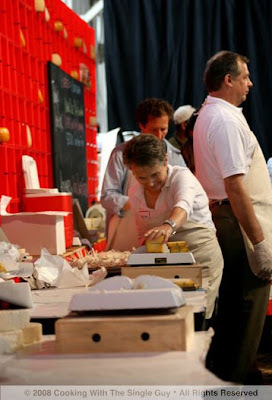 This sold-out event showcases several pavilions dedicated to a particular category of food. My ticket was for the day portion of the pavilion (from 11 a.m. to 3 p.m.), and I arrived at Fort Mason promptly at 11 a.m. and there was already a line to get in. I finally got through the gates at 11:20 a.m. and was given my "slow dough," which is a voucher worth $20. 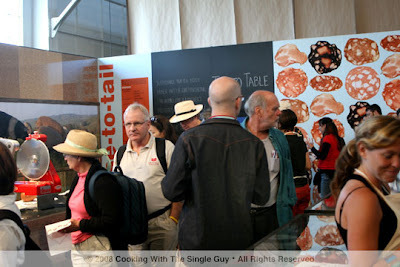 With my slow dough in hand, I can eat tastings at various pavilions and they mark off points from my voucher. Most pavilions charged between $1 to $3 for tastings, which were organized as either individual tastings or flights, which is a combination of foods. 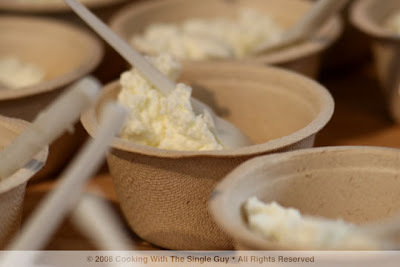 ... this fresh Chevre cheese from Dancing Goat Creamery in Byron Center, Michigan. 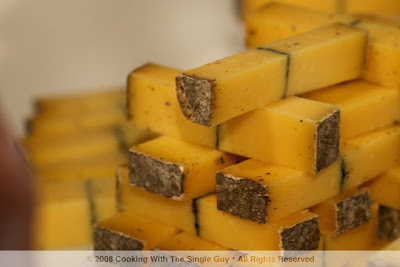 Now, some people might be thinking, hey, this is supposed to be local and sustainable so what's with the cheese from Michigan? 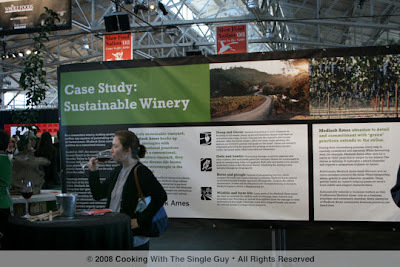 Well, this is the Slow Food NATION so that means there were featured products from around the country because the idea is that people who live in that area who came to town for this event will learn about their local products and taste it when they get back home. And it was a treat for me to get to try this cheese, which was slightly tart, creamy and a bit like ricotta. I liked it. Also being served was this Perdido, a cheese from Sweet Home Farm in Elberta, Alabama. It looks like cheddar and is firm like cheddar, but had a mild taste. I also liked this cheese, which was creamy yet firm. My favorite cheese happened to be the local version, which was the Pt. Reyes Original Blue from Pt. 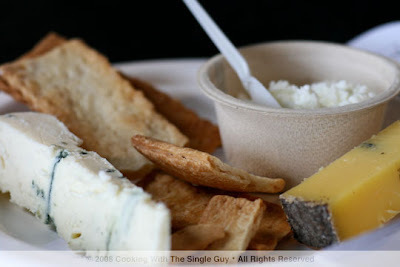 Reyes Farmstead Cheese Co. up in the North Bay. 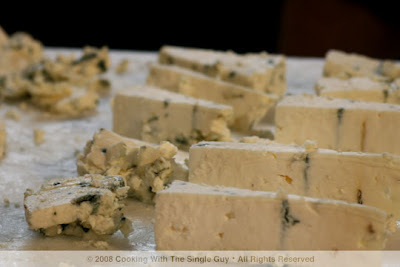 It was so pungent, which is great if you love blue cheese, and I doooo. The texture was also so soft and creamy, not super crumbly. It was so enjoyable. Here's my flight of cheese. They also served it with a tasting of apple butter from June Taylor, the Berkeley fruit compote and jam woman. I have to say I generally think June Taylor's products are a bit on the bland side, but this apple butter was amazingly bright and fresh with very strong flavor. I loved this too. ... the seafood pavilion. I'm a big fan of fish and seafood so decided to try the trio of tastings served here. This isn't it. 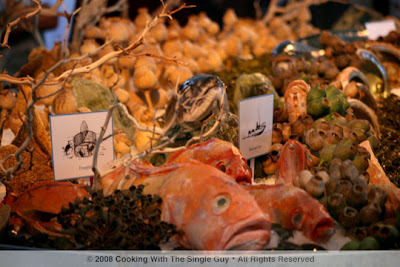 This was just a display of whole fish and other seafood items. It's like an aquarium, but without the water. Here's what I ate at the seafood pavilion. It was a trio of seafood, starting with this albacore tuna with white beans. This was prepared by Piatti Restorante & Bar in Mill Valley. It was OK. The tuna was very meaty but I thought the beans were too al dente for my taste. Oh. My. Gawd. I looooved this offering from Nopa in San Francisco. 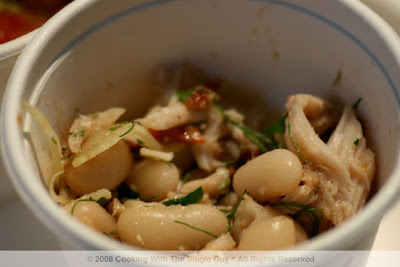 Nopa is one of the city's most popular restaurants and I am going to run to this place soon if all the food is as good as this marinated squid dish with beans. The squid was tender and tasty and it was in a tomato-based sauce. As you ate it, you discover these little bits of bread crumbs that offered another texture to contrast with the silken squid pieces. As I ate this, I took notes and all I wrote was YUM. Here's the third offering in the seafood tastes. It's a sardine stuffed with cheese, which I think was buffalo mozzarella, prepared by Dopo restaurant, which is my neighborhood restaurant! 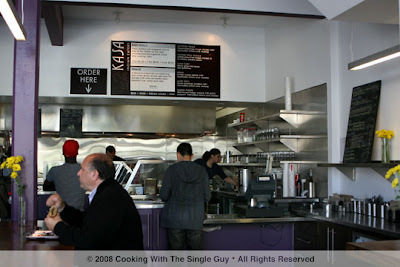 I live just 10 minutes from the restaurant on Piedmont Avenue in Oakland. It's another popular Italian place, and this particular dish was excellent. The sardine was incredibly meaty and tender, and blended so nicely with the cheese. So simple and so tasty! 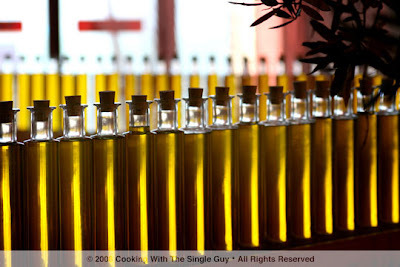 Olive oil at the olive oil pavilion. I didn't get in line to check this out, but I loved their display. 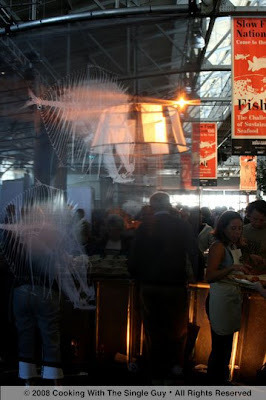 Another place that I didn't really visit, again because of the amazingly long line, is the charcuterie pavilion. Of course, meat would be a popular spot. This "tail to table" themed pavilion had workers slicing up fresh charcuterie. 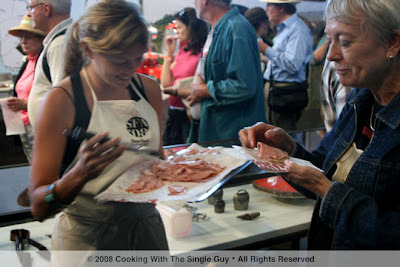 Here's a volunteer serving mortadella to a hungry taster. Not sure what this is, but it got spared the slicing. I bet they were saving it up for the night crowd. ... the ice cream pavilion. You can bet this was also very popular, but the line at least wasn't crazy long like the charcuterie line, so I got ready for my flight of ice cream tastings. I really loved how organized the ice cream pavilion was set up. They created three flights called "Classic," "Modern" and "Alternative." Each flight offers flavors that support the theme. 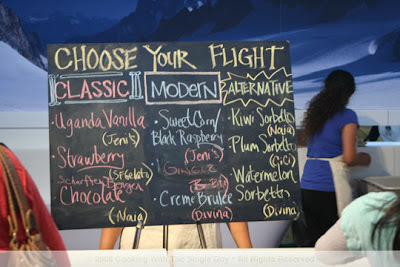 I decided to go for the Modern flight, which included the following flavors: sweet corn/black raspberry (from Jeni's Ice Cream), ginger (from Bi-Rite Creamery of San Francisco), and Creme Brulee (from Divina). Yeah, ICE CREAM! Here's my modern flight, and I loved each flavor. The sweet corn was distinctively corn-like (I almost said corny, ha!) but was nicely covered up with raspberry almost like a raspberry sauce on a sundae. The ginger from Bi-Rite (which I've had before) was just as intense and wonderful, and the creme brulee was sweet but not super sweet. 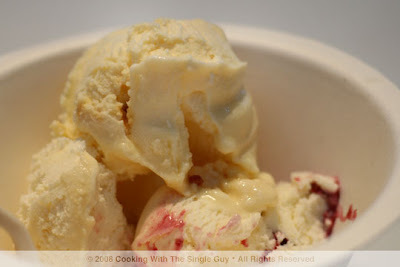 All three ice cream from different makers all had amazingly similar creamy texture, just so wonderfully thick and rich. 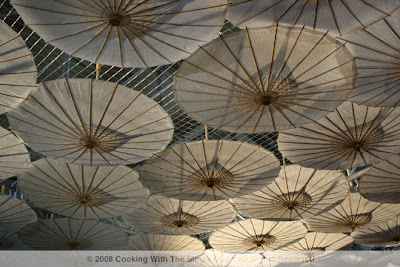 Some paper umbrellas hanging from the ceiling of the "spirits" pavilion, which focused on alcohol. You can bet this was also a pretty popular pavilion, but I skipped it. Again there were so many pavilions, I had to be really strategic to decide which ones to stand in line for. In the end, I still didn't get to go to every pavilion. But I did see more than what I featured above, and I'll report on those tomorrow. So come back for more! Everyone has his or her favorite cuisines. Mines include Vietnamese, Italian, Korean, French, California, Japanese, Hong Kong-style Chinese, and some Hawaiian. Since that’s not an exhaustive list, then that means there are cuisines that are not among my favorites. Such as Indian. While I don’t go out of my way to seek out Indian food (I find everything either cooked to a mush or barbequed to dryness) that doesn’t mean I don’t eat it now and then. It’s mostly my hopes of someone changing my mind. 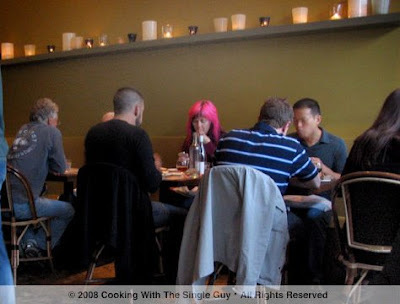 A friend recently showed me the Kasa Indian Eatery in the Castro, which opened in June, and I was so intrigued by its concept that I recently visited for lunch. 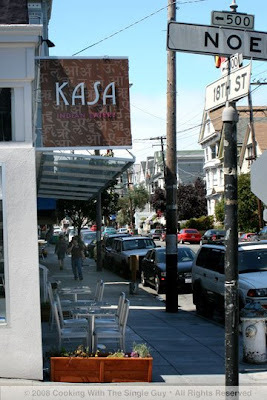 Kasa is right at the corner of 18th and Noe Streets, in a spot that used to be a cheap taqueria. I remember that I would go to the taqueria for a quick and simple meal when I couldn’t decide what to eat in the neighborhood. So I was kind of sad to realize that it was no longer there. But enough with memory lane. I walked into Kasa and immediately thought that this is not like any of the Indian eateries I’ve been to before (not that I’ve visited that many). It was modern, sleek, hip and stylish with its aluminum bar stools, bright yellow flowers and photojournalistic black-and-white images on the wall. It really played to the casual-but-hip approach to eating by the owners, Anamika Khanna and Tim Volkema. Kasa doesn’t offer a full Indian menu but focuses on a kind of Indian street food known as kati rolls. It’s been described as an Indian burrito. 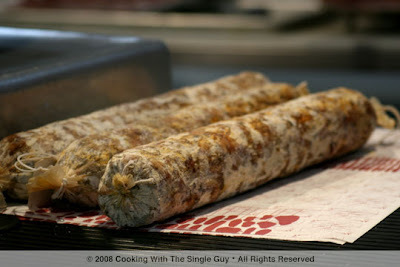 So it’s basically a wrap using a flaky, buttery wrap called a roti. You can order six different fillings for your kati rolls or you can order a thalis, which is basically a deconstructed kati roll with a bit more sides. You order at the counter and watch the people assemble your kati roll or thalis, and then you sit yourself and chow down. I decided to get a thalis plate of chicken tikka (charbroiled free-range chicken, not to be confused with tikka masala which comes covered in sauce). They also had a special that day of Gobi Aloo, a curried cauliflower and potato dish, so I ordered a side of that. 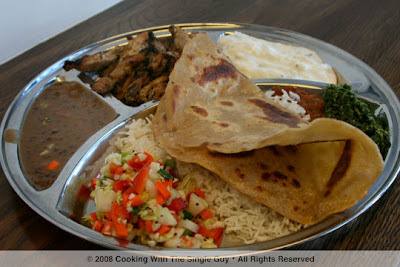 The thalis is actually a big platter of food, starting with your main (my chicken tikka) and sides of basmati rice, daal (which is typically slow-simmered lentils), raita, chutney, marinated onions and a pickled crunchy garnish salad. 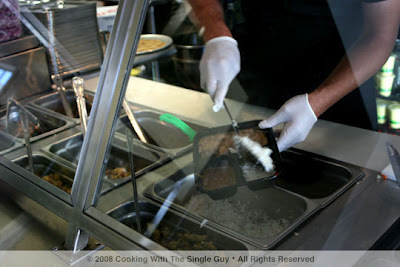 On top they place one sheet of the roti, which I guess you can use to roll your own kati roll if you felt like it. First the side of Gobi Aloo. I’m always interested in any kind of spicy cauliflower dish because I love cauliflower and would love ideas on how to prepare it differently. 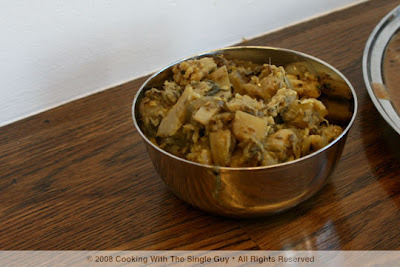 The Gobi Aloo was, unfortunately, very much like what I think of Indian food to be—a bowl of mush. The cauliflower and potatoes were so overcooked that I wondered if there were any nutrients left in the vegetables. And I don’t think the whole bowl was just cauliflower because it seemed like they mixed in some broccoli as well. It looked like this grey-green mush. I barely finished it. For my platter, I started with the chicken tikka pieces because they looked the safest. It was good and tasty, but I wouldn’t necessarily describe it as incredibly moist. Then I took a bite of the roti, but I was nervous from the start because the wrap was glistening from either melted butter or oil used to fry up these babies. It definitely tasted home-made, which was good, but I couldn’t get past the greasy buttery coating. The other parts of the plate were all fresh and tasty, from the cooling raita (yogurt with cucumbers and mint) to the tart crunchy salad. The daal was nice and tasted almost like a chutney. You can tell that the quality of the ingredients is top-notch, but I felt that it actually probably would have tasted better combined. So a kati roll probably would have been the better route to go, if I can just get past the greasy feel of the roti. Because I spent more than $15 for my lunch ($10.95 for the thalis platter and another $5 for a side of the Gobi Aloo), I felt the food needed to knock it out of the ballpark. Or at least make me an Indian cuisine convert. It did not. Kasa is a refreshing spot for the neighborhood and you’ll probably enjoy it if you love Indian food. But I kind of wish the old taqueria was still around. No rating since this is a mini review. And just because I don’t roll with the roti doesn’t mean it might not be for you. I definitely like the scene but am still not sold on Indian cuisine. Lunch, 11:30 a.m.–3 p.m., Wed.–Sat. 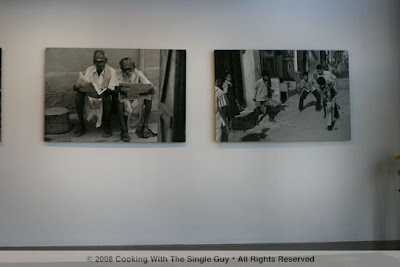 ; dinner, 6–10 p.m., Tues.–Sat. ; brunch, 11 a.m.–3 p.m. Sunday. Closed Mondays. Dining early is the key to visiting Bar Jules, the popular tiny restaurant on the edge of Hayes Valley. Opened since December 2007, the café has created quite a buzz about its daily changing menu and fresh, sustainable faire. And since it takes no reservations, you can expect a long wait if you arrive anytime after 7 p.m.
Bar Jules’ chef/owner Jessica Boncutter has worked at the nearby Zuni Café, so it’s no surprise that her menu reflects the fresh, seasonal, simple cooking of Judy Rodgers. 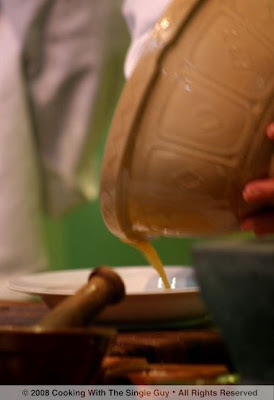 But Boncutter has made Bar Jules a real chef’s restaurant because the menu is limited to only a few selections, which makes it almost like a daily tasting menu or an eat-what-we-cook approach ala Ad Hoc in Napa Valley or Chez Panisse in Berkeley. So you need to go with an open mind and an adventurous appetite. If you’re nervous about what will be on the menu, you can get a sneak peek on the restaurant’s Web site after 11 a.m. every day; they’re very good about updating it. 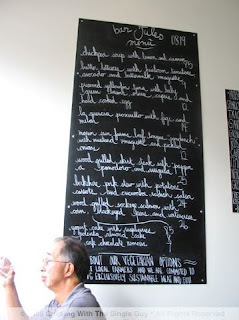 On the night we were there, eight dishes were listed on the menu, which is written on large chalkboards on the café’s walls. There were a soup (chickpea), a salad (butter lettuce with heirloom tomatoes), what looked like three appetizers or starters, and three entrees. The menu definitely reflects the seasonal ingredients as well as a couple of unusual items (our night’s menu included a beef tongue sandwich). There’s also a vegetarian option that you can request from your waiter. Foodhoe and I started with the Preserved Yellowfin Tuna ($12) and plate of La Quercia Prosciutto with figs and melons ($14). 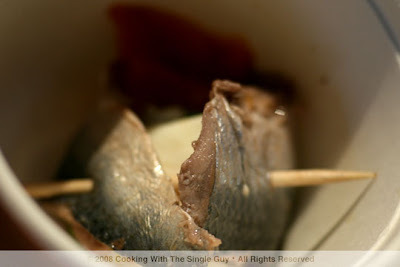 I’d never heard of preserved tuna and love yellowfin tuna from eating at sushi restaurants, so I had in my mind a sashimi-like yellowfin maybe a bit tougher due to pickling for the preserved angle. 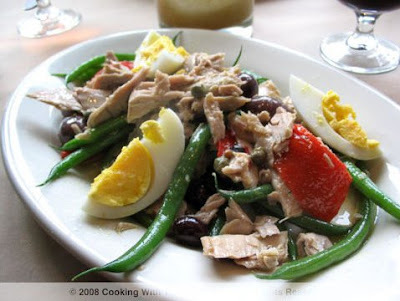 Instead, it came out looking like cooked tuna on a Mediterranean-style salad. Foodhoe actually said it looked like premium tuna from a can. Don’t get me wrong, it tasted much better than tuna from a can, but still the texture was quite like canned tuna. The bed of greens under it was crunchy and I liked the added cooked eggs for even more protein, but it was one of those dishes that sounded better when you ordered it than when it arrived. 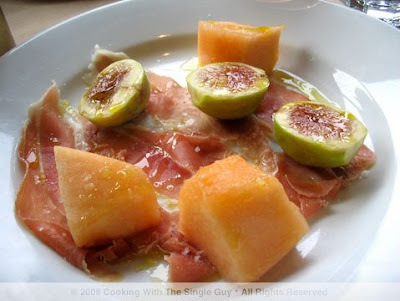 The prosciutto plate was a classic presentation of thin prosciutto strips with chunks of fresh cantaloupe and sliced figs, topped with a sprinkling of sea salt and olive oil. It was fresh and seasonal, but nothing to travel across the bay just to try. 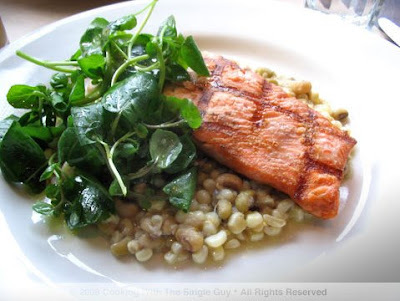 For our entrees, Foodhoe got the Wood-grilled Sock-eye Salmon with Corn, Black-eyed Peas and Watercress ($26). It was a cleanly presented plate of richly colored salmon on top of a plate of corn and peas with a small watercress salad on the side dressed in a simple vinaigrette. The salmon was nice and flaky while the corn reflected the sweetness of summer. Again, all the flavors were clean and crisp but nothing illuminating. 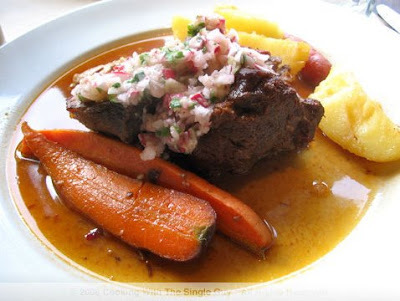 I went with the Berkshire Pork Stew with Potatoes and Cucumber-radish salsa ($24). The pork was tender and flavorful, and Foodhoe helped me out by eating most of the parts with the fatty edges. 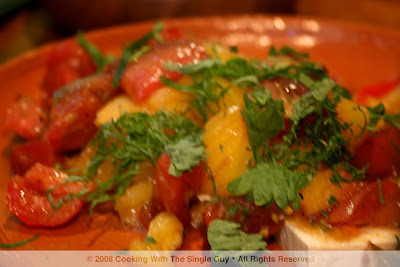 I especially liked the cucumber salsa, which added a nice brightness to a generally heavy dish. The meal was filling and our server was very knowledgeable and helpful in making wine recommendations (the wine list is also handwritten on a chalkboard near the bar). There were three items for dessert, but nothing really thrilled me—yogurt, chocolate or polenta cakes. But Foodhoe couldn’t resist the chocolate cake, which was listed as River Café Chocolate Nemesis ($7) on the menu. Our waiter told us that it was a no-flour chocolate cake. 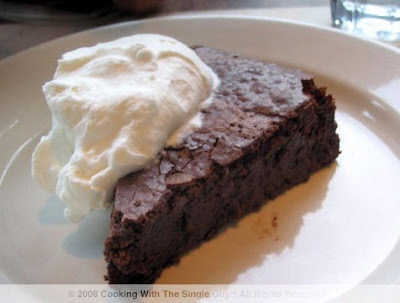 When it arrived, it looked like any no-flour chocolate cake with a dollop of whipped cream on top. I tasted a couple of bites and it tasted like a brownie, although not as sweet or dense. Half-way through our dinner, the place completely filled up with what looked like a lot of nearby residents. A couple even braved the cold San Francisco foggy night to sit outside rather than wait. In some of the reviews I’ve read on the Web, several people mentioned that the service can be a bit delayed between the starters and the entrees, but Foodhoe and I didn’t notice much of a wait between courses. Then again, it may be because we were eating during the early bird hours. 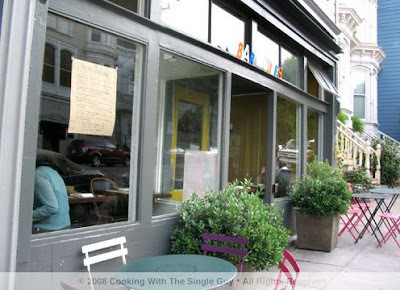 I used to live in Hayes Valley and if I still did, I probably would visit the cozy and charming Bar Jules once or twice a month. But the food, while solid, doesn’t inspire me to travel far to try its dishes. 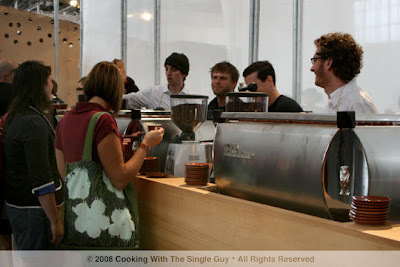 It definitely is a refined neighborhood café that’s perfect for the locale but far from a destination restaurant. 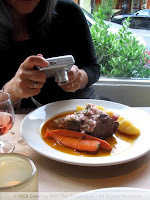 Read Foodhoe's take on dinner and see her beautiful photos here.